Two titans of country and bluegrass music who helped make The Grand Ole Opry and the Ryman Auditorium the storied institutions they are, were repaid with eternal markers for their contributions when life-sized bronze statues of the two men were unveiled on the grounds of the Ryman this week in Nashville. “Little” Jimmy Dickens was a fixture of the Opry for decades, and when he died on January 2nd, 2015, he was the Opry’s oldest living member. Bill Monroe is considered the Father of Bluegrass, and also played and indelible role in bringing the Grand Ole Opry to prominence. 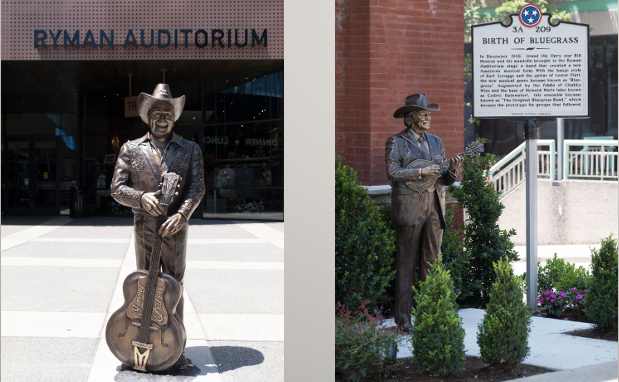 The bronze likenesses were commissioned by the Ryman Auditorium in recognition of its 125th Anniversary, and sculpted by artist Ben Watts. Little Jimmy’s statue is on Fourth Avenue and adjacent to the statue of riverboat captain Thomas G. Ryman, who the Country Music Mother Church is named for. Bill Monroe’s statue is located near the Fifth Avenue driveway, right beside the plaque commemorating the birth of bluegrass. Ricky Skaggs, who was a long-time understudy of Monroe and is seen as one of the keepers of his legacy, and Brad Paisley, who was one of Little Jimmy’s best friends, were on hand to do the ceremonial unveiling. The Ryman Auditorium went through a $14 million renovation in 2015, and the two statues add to the gravity visitors already feel when they walk onto the grounds, and into the Mother Church. The building first became the home of the Opry in 1943, where it remained until the Grand Ole Opry House was built in 1974. The Grand Ole Opry continues to hold shows at the Ryman location upon occasion, while the venue has become one of the most revered performance halls in the world. Trig, can we expect CMT reviews tomorrow? Ok. Thanks I tried watching it for 5 minutes but after that I didn’t feel like continuing self harm. What have you got against Trig to make him review that pile of horse hockey? This is LONG overdue, but I’m thrilled to see Bill Monroe finally get a statue here.